3 leaves of textual records. Brenda Joy Gavel was born in November of 1949 and is the daughter of Verna (Turple) and Rex Gould Gavel. She married Barry Baker and they live in Lake Charlotte, NS. Brenda and Barry had two children. Brenda began attending Clam Bay School in 1955 when she was six years old. The Clam Bay School was a one room building with one teacher and included grades primary to eight. After grade eight, students went to Musquodoboit Harbour School. In February of 1959, the Clam Bay schoolhouse burnt to the ground and students were sent to Robert Jamison School for the remainder of the year. That summer, the Upper Lakeville schoolhouse was moved to Clam Bay, however the school trustees were unable to find a teacher for the 1961-1962 school year and students had to be sent to the Clam Harbour School and subsequently to Harbourside School in Owl’s Head when it opened. The building was last used as a school in 1961, after which time it was used a community hall where card parties, dances, church and youth activities were held. 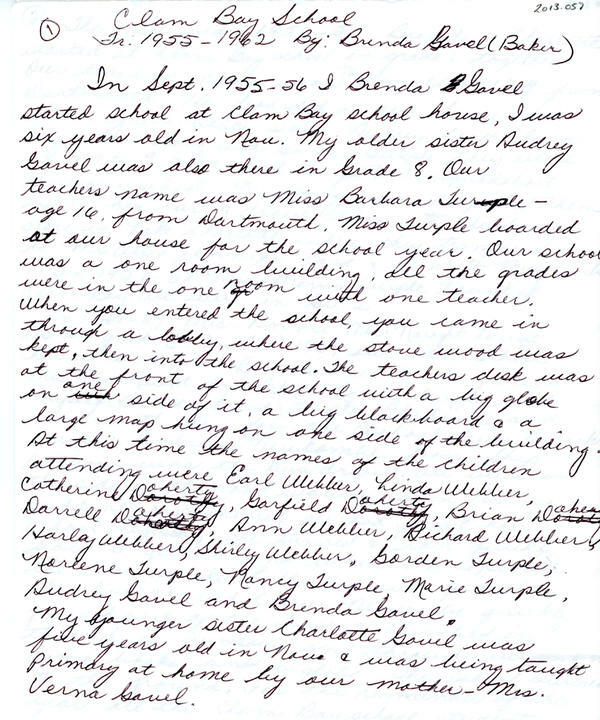 Teachers who taught at the school between 1955 and 1961 included Barbara Turple, Ronald Hollett, Mavis Turple, Annie MacNaught, Mrs. Reg (Marguerite Mosher) Webber, Verna Gavel, and Miss Lamb. Records were donated to the Eastern Shore Archives by Brenda (Gavel) Baker sometime in or after 2007.